The lawsuit challenging the September 2015 forced eviction and demolition of hundreds of homes and businesses in Badia-East community came up for hearing on 9th May, 2017. 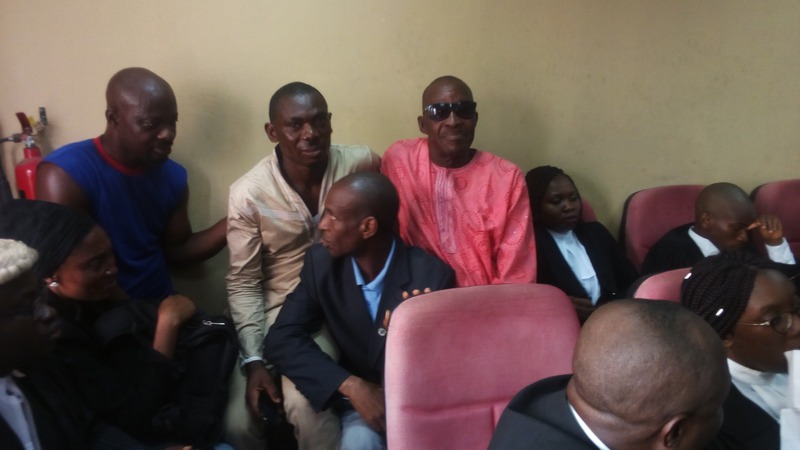 As usual, the courtroom was crowded with a large number of evictees that besieged the courtroom at the Federal High Court in Lagos. Some were lucky to find seats inside the courtroom, while many others had to stand for no less than three hours before their matter was called. With their huge presence on the hallways, down the staircase and inside the courtroom, the evictees were not only attending a court session, but announcing their determination to get justice no matter how long it takes. SPACES FOR CHANGE filed the lawsuit on behalf of the community in July 2016, and has ever since, been providing free legal representation to over 1,000 displaced families in Badia, rendered homeless at the peak of torrential rainfall on 18 September 2015 on the orders of the Ojora Chieftaincy Family, and aided by the bulldozers operated by officials of the Lagos State Government. The forced eviction of thousands of Badia residents has left thousands of people including women and children homeless, and exposed to inclement weather conditions. When the matter was called, SPACES FOR CHANGE’s Mrs. Chioma Uguru, Esq. and A. J. Ohwaguono, Esq. announced their appearances for the evictees while Ejiro Ogbekele, Esq. entered appearance for the fifth and sixth respondents (the Ojora Chieftaincy family}). The other respondents–the Inspector General of Police, Commissioner of Police Lagos State, Ministry Of Physical And Urban Development, Lagos State, and the Government of Lagos State–were not represented despite proper service of court processes on them. SPACES FOR CHANGE addressed the court on the question of jurisdiction in determination of whether forced eviction and demolition of the defendant’s properties can be lawfully challenged using the Human Rights Fundamental Enforcement Procedure Rules. The Court is to determine whether the subject matter (the evictees’ claims) falls within the Court’s jurisdiction and whether it has been initiated using the appropriate legal procedures. 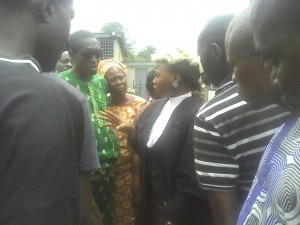 The Evictees/Applicants contend that the devious and inhuman circumstances surrounding their forceful eviction and the demolition of their homes and business premises in Badia, Lagos State, flies in the face of the constitutional right to dignity of the human person which has occasioned great hardship and even death among women and children, loss of movable and immovable properties, and continuous threat on the personal liberty of the Applicants through arrests and detentions. These claims all fall under the fundamental right provisions jealously guarded under Chapter 4 of the Nigerian Constitution. After presenting these submissions to the court, the legal team adopted their written addresses on the issue, and the court, thereafter, adjourned to the 13th of June, 2017, for ruling. After the court hearing, the evictees within and outside the courtroom quickly assembled outside the court building where SPACES FOR CHANGE’s legal team briefed them on the court proceedings. Together with the evictees, they discussed the next legal steps to be taken in the matter, including related advocacy strategies. SPACES FOR CHANGE and marginalised groups use the law and justice systems to contest human rights violations and improve their access to basic amenities such as housing. As part of a wider strategy to empower communities affected by forced evictions, they combine the resort to court systems with other forms of legal action, As a result, displaced residents are using this court action to demand information, meaningful local consultation, fair and adequate compensation. Beyond litigation, they are also leveraging on the court action to fight against other governmental or private conduct that undermines their rights and ways of living.